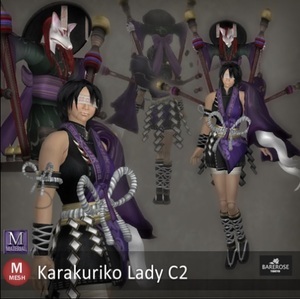 The Bare Rose Karakuriko Lady C2 is a very Japanese Folktale inspired outfit which feature a Kitsune (Japanese Fox Spirit) controlled marionette or puppet and made in the very traditional style of Dashi Karakuri which were typically used in festivals. The beautiful MESH outfit comes in a bright purple with shoulder stand for the Kitsune with various engraving of mystical spells like writing on Kitty as well as the Fox Spirit. There is also a blindfold which is entirely optional which gives the impression that Kitty is being controlled entirely by the Kitsune as she is not seeing. If you look closer, you can see the joints on the limbs which really makes Kitty look like nothing but a puppet. This outfit also comes in multiple parts which is entirely up to you to take away if you want to customize it for your roleplay or design purpose. Even from the back, you can see how details the outfit is with the Japanese Talisman hanging over the waist and the full detail of the Kitsune back stand. This is the perfect outfit to be in for roleplay of a controlled puppet. Even controlled, Kitty do get tired too, especially carrying the Kitsune around. So there are always time to rest. The outfit is mesh and well designed so much so that even in various different positions, there is no sign or cracks of outfit cutting into each other. Look at how Kitty knees down and there is absolutely no defects at all.